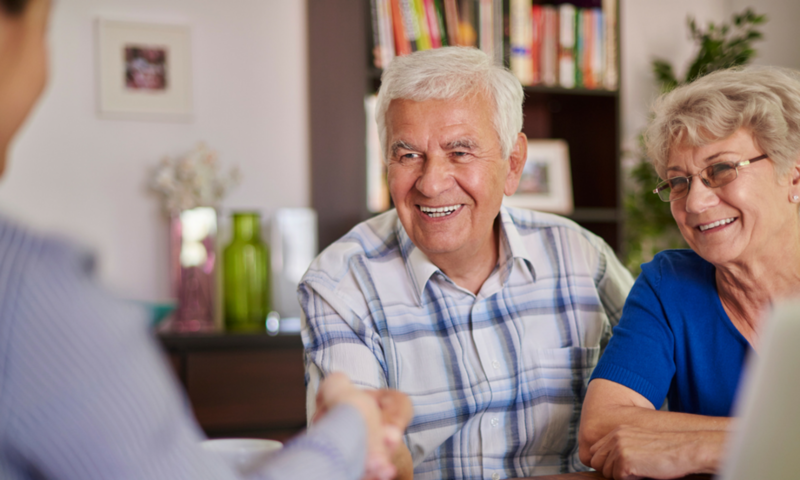 Increase your closing ratio when working with seniors with the Pivotal-Accredited Senior Agent™ licensing program. Canadian REALTORS® face many challenges within their business and for many they face complex challenges when working with seniors. Canadian REALTORS® are also faced with education requirements and advancing their knowledge base. With all the pressures in maintaining education, brand recognition, financial viability and competition, meeting the senior demand will become more of a factor facing REALTORS®. Missing a deal because you were not informed in knowing possible solutions, housing opportunities or simply how to understand the seniors’ needs is a costly mistake with a simple solution. 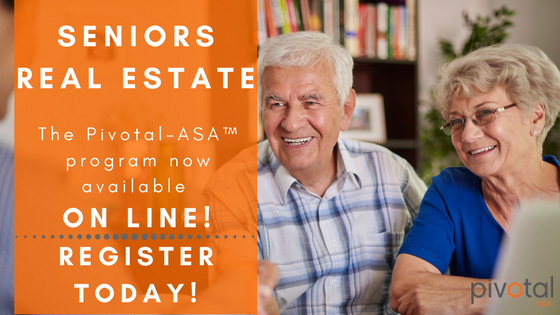 After 10 years of offering Canadian REALTORS® education when working with seniors, the Accredited Senior Agent™ program has now advanced to the Pivotal-ASA™ program and is available on-line. Now ALL Canadian REALTORS® can cost effectively access the Pivotal-ASA™ program and upon completion, become licensed in applying their new skills, opening their market strategies to target a huge transitioning demographic in their market – SENIORS. and increase your closing ratios! ALL marketing and promotional materials have been updated and redesigned in 2018. Simple for you to begin marketing your new license. 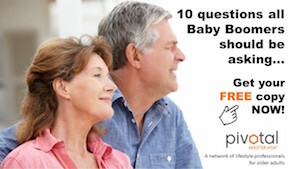 All designed to get you started in successfully handling more deals with seniors, and getting more referrals from them. REALTORS® should always be advancing their education regardless of credits or monetary benefit. A good agent is one that passes the real estate courses. An exceptional one presents updated information and solutions to help clients make informed decisions. 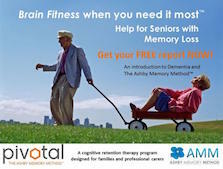 The Pivotal-Accredited Senior Agent™ program aims at delivering a basic understanding in working with seniors and older adults. For those REALTORS® with a more specific desire to sharpen their skills and narrow their senior niche market, the Pivotal Master-ASA™ program offers to advance their involvement within the senior transition market and join an elite group of senior-specific REALTORS®. The Pivotal-ASA™ LIVE EVENTS training program may be offered by founder, Barry Lebow. With his more than 50 years in real estate, Barry brings decades of knowledge and insight to real estate. As the founder of the ASA™ program and combining efforts with Pivotal Aging Innovations Inc., the redesigned and re-written Pivotal-ASA™ program promises to deliver experience in what works and what doesn’t work, where to spend your time and how to grow your senior business. Pivotal Aging Innovations also delivers insight from within the care providing industry and corporate views. As a principal partner, Paul Cutajar holds his real estate license in Ontario and continues to develop programs and the advancement of the Master-ASA™ program. Pivotal also calls upon several industry consultants and advisors to provide guidance, program development and marketing opportunities. Fantastic info and the instructor was dynamic, well informed on topics, engaging and I recommend this course not only to agents but others that are interested in learning more about the seniors market! Cheers! Once again, the most informed instructor and educator I have met. I will be annually updating my knowledge through your seminars. Andrew Tamburello – One of the best courses I have ever taken!! Shirley Smurlick – Awesome course, I learned more than I thought was possible in two days. Can’t wait to get started. Thanks. Heather Cowie – So jam-packed with knowledge I can put to very good use in growing my business. Error: Error validating access token: Session has expired on Tuesday, 16-Apr-19 05:28:39 PDT. The current time is Friday, 19-Apr-19 22:12:11 PDT.